Growing up in a county where the perennial question revolved around whether Mayo footballers would ‘do it’ this year, the GAA was so interwoven into the tapestry of parish life that to question it was akin to questioning my parents’ marriage. We, the grass-roots members, were as guilty as the GAA detractors of seeing it as a Gaelic, Catholic-Nationalist monolith, which also ran the annual North Mayo Junior-B football championship (except that we didn’t mind as much). Now, thankfully, the GAA is being critically re-understood in a general reappraisal of modern social history. This new academic focus is seen in the formation of Sports History Ireland in 2005, a society with an ambition to ‘… establish a network of local historians […] interested in working in sports history’, thus encouraging and facilitating insights into the challenges faced by the association at grass-roots level. 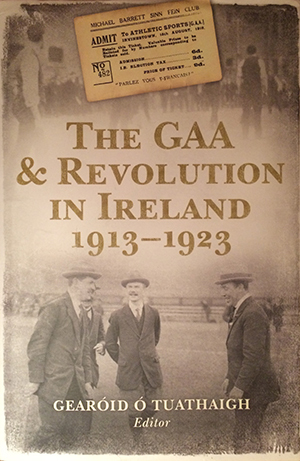 The GAA and revolution in Ireland 1913–1923 is itself preceded by Cronin et al.’s GAA: a people’s history. While this new, crafted collection of essays comes endorsed by Aogan Ó Fearghail, president of the GAA, they are hardly a polemical eulogy to the association. 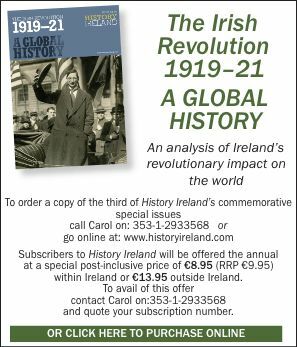 In his introduction, editor Gearóid Ó Tuathaigh sets out his aim to ‘contribute to an understanding of the decade of revolution in Ireland […] by viewing the events […] through the prism of an organization central to the associated culture of Ireland’. He has selected an impressive team of contributors: sporting journalists, published historians, teaching academics and an ex-Dublin footballer. With diverse and interesting viewpoints, the book brings to life the difficulties that beset the young association as it manoeuvred itself through one of the most tempestuous decades of modern Ireland. We learn why the GAA succeeded in becoming the dominant Irish sporting and cultural organisation, and how its games evolved into the most tangible of expressions of our identity. Cormac Moore documents the magnificent Luke O’Toole, the GAA’s first full-time administrator and unsung hero, while Páraic Ó Duffy, with Gearóid Ó Tuathaigh, detail the debt it owes to him and such influential ‘back-room men’ as James Nowlan and Frank Dineen. Their worth was due in no small part to their maintenance of a united organisation with an official non-political ethos. Indeed, these ‘young reformers’ revived a near-extinct GAA to make 1913 its most successful year up to then—culminating in the purchase of Croke Park as the association’s headquarters. James McConnell examines how the GAA offered ‘zest for tangible rather than rhetorical reminders of Irish identity’, and while the Irish Parliamentary Party complained that Sinn Féin was politicising the GAA, the truth at grass-roots level was rather messier. In fact, Paul Rouse relates how the expansion of the GAA before 1916 left it less likely to adopt a ‘radical nationalist position’ despite the heavy presence of IRB members on the controlling committees, as across the organisation ‘winning and watching matches’ is what inspired most. Richard McElligott and Mike Cronin both disentangle the complexities of conflicting factions of interest, wrestling in the turmoil leading to the emergence of the Irish Free State. All the while the GAA strove to maintain a coherent survival course, even becoming a passing victim in the conflict. Diarmaid Ferriter’s comprehensive narrative places the GAA within the broader context of Irish society and competing sports. His colourful synthesis is the playing pitch on which we see the preceding essays play out. As the association swiftly embraced the new Free State, he concludes of the divisions caused by the Civil War that ‘there were severe limits to the GAA’s powers of healing’, yet that it refused to allow the ‘bitterness of national division infect the GAA, and that it held its own community around its games as best it could’. The book also delves into other, less obvious study areas, such as Eoghan Corry’s ‘secret history’ of the survival of camogie, Ross O’Carroll’s examination of the ‘indelible mark’ that the First World War left on the association, and Paul Derby’s discussion of how the GAA’s American diaspora eased the immigrants’ transition and provided radical support for a united Ireland at home. Mark Reynolds reveals the steely commitment to playing GAA sports by Irish political prisoners in internment camps, while Donal McAnallen writes of the GAA in Ulster after partition and how the deep unionist suspicion of the GAA and the implementation of partition affected the association. This is a handsome publication, interspersed with contemporary (and well-chosen) photographs while throwing up surprising facts, such as Seán Moran’s revelation of the level of professionalism in the early training camps for county teams, including the direct payment of players who missed out on wages while attending them! Gearóid Ó Tuathaigh and Collins Press (with its long experience of publishing noteworthy, popular, Irish historical books) bring academic momentum to reconfiguring Gaelic games as a subject worthy of scholarship and learning. Sport has become a subject of serious historical study in recent years, and despite its omnipresence in Irish cultural and sporting life the role of the GAA in the revolutionary period has never been adequately explored. As the GAA president entreated in his foreword, ‘I hope clubs and counties in Ireland and around the world will be motivated to further investigate events and stories in their own communities’. This publication should provide a championship win in that endeavour. Liam Alex Heffron is an MA student in history at NUI Galway.